Holocaust museum to open new branch in Negev city to deal with increasing number of requests and visitors. 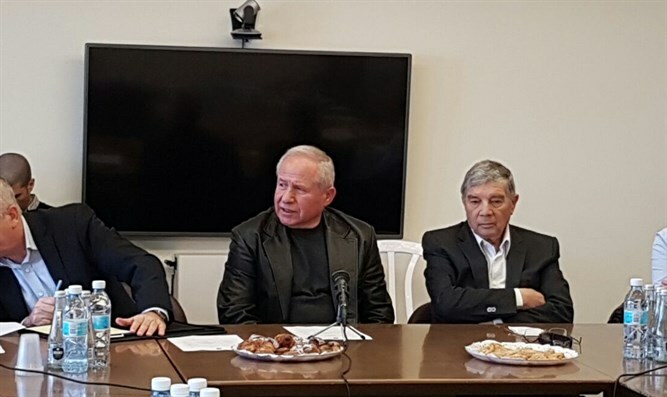 The Knesset Foreign Affairs and Defense Committee, headed by MK Avi Dichter (Likud), held a special seminar today at Yad Vashem to mark International Holocaust Remembrance Day, which was marked around the world last Friday. The seminar was attended by MKs Moti Yogev (Jewish Home), Aliza Lavie (Yesh Atid), Menachem Eliezer Moses (United Torah Judaism), Ksenia Svetlova (Zionist Union), Amir Ohana and Anat Berko from Likud, and Brig. Gen.(Ret) Avner Shalev. The committee toured the Yad Vashem Archives, held discussions on the challenges of Holocaust commemoration around the world, ideological disputes regarding Holocaust research in the "Center for Major Questions." Brig. Gen. Shalev said: "The phenomenon of Holocaust denial is on the decline. There always has been and always will be in certain sectors a denial that there ever was a Holocaust, but it is relegated to the sidelines and is marginal. However, there are no authorities fighting against it in the Muslim world, and therefore the phenomenon of denial does not decrease further." "We see a lot of willingness from teachers from all over the world to come to learn. We have 70 seminars around the world each year, with 56 of them being with [groups] from Europe. We educate about the Holocaust, and also of the heroism of the Jews, who did not go like sheep to the slaughter. There is hardly a single Jew who survived who was not helped by another Jew. Jews fought to keep their Jewish values and the values of mankind." Shalev continued. He said that Yad Vashem is becoming overwhelmed with the volume of visitors from schools, which reaches 120,000 students a year, in addition to other visitors. It was revealed that the Foreign Affairs and Defense Committee had agreed to construct a new branch of Yad Vashem in the city of Bahadim in the Negev, where a number of IDF bases are located. Dr. Haim Gertner, the Director of the Yad Vashem Archives Division, said that Yad Vashem volunteers from around the country had gathered more than 219,000 items and pieces of evidence related to the Holocaust over the past six years. He also stated that the Yad Vashem website was second greatest target for hacks in Israel, trailing only the Foreign Ministry in hacking attempts. Committee chairman MK Dichter said: "The experience of Israeli adults is such that we can't help but ask ourselves hard questions after the Holocaust. And we often try to deal with what has happened to us since then. I always point out that after the Yom Kippur War, I met a good friend who fought against the Egyptians and said that there was a Holocaust there. I told him that to call that a Holocaust showed a lack of understanding of what the Holocaust was. My friend told me: "I was captured from my outpost, and I called out. They promised to come and rescue us, but they never came." I told him, "That is the difference. During the Holocaust, there was no one to call, and no one to answer."